“Southern Gentleman” is an adventurous stone sculpture from start to finish. Blue Onyx is only known to exist 13,000 feet up in the Andes mountains of Argentina. The fellow who discovered this quarry chewed coca leaves in order to tolerate working at such a high altitude. He also hired some local workmen to help with the task. They loaded one truck with the stone and this fellow then drove it from South America to the U.S. paying a tax at every border crossing on his journey. On arrival here, he vowed he would never do this again. This accounts for the rarity and high price of Blue Onyx. Carving “Southern Gentleman” was also an adventure. The stone exists in nature encased in a thick layer of oxidized stone, so it is very difficult to see the colors and figures of the stone in its raw state. One can never be sure of what one is getting until this oxidized layer is removed. Even then, it is only the most obvious colors and shapes that are visible. 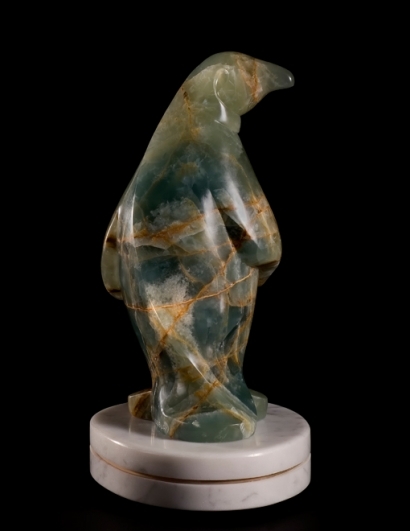 When I carved this little penguin, he was a soft light blue color. I could see the brown and white natural lines and inclusions. This made me a bit nervous about the sculpture’s chances of surviving the creation process. I carefully cut the stone with a diamond blade, and ground the shapes into being with diamond burrs. To use any kind of percussive tool would probably have shattered the stone. Onyx is quite brittle. After each day of carving, I carefully bathed my sculpture in cyanoacrylate, a very low viscosity super glue. My goal was to fill any potential gaps and fissures which might cause it to break. The colors, layers, and depth of Blue Onyx were not revealed to me until I began the sanding process. I began sanding at 60 grit and took the surface up to 600 grit. With each successive grit I saw more colors and layers in the stone. Onyx is a semi-precious gem stone and quite translucent. At 600 grit I could see at least an inch into the stone. The criss-crossing lines and blocks of color were like looking into a kaleidoscope. Sanding is close work, and it was almost dizzying to peer into these formations that are millions of years old! I knew from the moment I saw this stone, even in its oxidized wrapper, that the figure must be a penguin. I chose to publish the back view of “Southern Gentleman” because I love the curve of the backbone as it sweeps up through the pose. The brown and white lines are readily apparent, as are the colors that range from pale sea green to deep turquoise. I chose white marble, reminiscent of snow, as the base presentation. I later heard from my stone broker that the fellow who quarried this Blue Onyx had gone back for a second pallette. This was great news to me as I thoroughly enjoyed the experience of carving this stone, and can now look forward to another adventure.